July 2013 - Playmates Toys is bringing the Teenage Mutant Ninja Turtles to the 2013 San Diego Comic-Con International, with a panel about the action figures and an exclusive Shredder action figure. Shredder will be sold at the Nickelodeon booth, so mark your floor maps now! Teenage Mutant Ninja Turtles: Action Figure Showcase - Playmates Toys, the master toy licensee for Teenage Mutant Ninja Turtles, is hosting a panel during Comic-Con. What: Hear what's now, new and next for our favorite action figures! The panel will offer sneak peeks at future toys and attendees can ask questions of 'team green' members who've worked on all three incarnations of the Turtles since their debut decades ago. EL SEGUNDO, Calif., Feb. 8, 2013 -- Playmates Toys is set to unveil the action-packed next generation of the Teenage Mutant Ninja Turtles toy line, inspired by Nickelodeon's hit new CG-animated show. New elements, including the mysterious Ooze substance and Turtle-loving pizza, have been added to the product line and will be displayed at the American International Toy Fair in New York City, February 10-13, 2013, Booth #1525. Teenage Mutant Ninja Turtles premiered on Nickelodeon on Sept. 29, 2012 and was an instant hit, drawing almost 12 million viewers during its premiere weekend. Coinciding with the series, Playmates Toys, the mastermind responsible for the successful toy line over the last three decades, introduced a new line which became one of the top action figure brands by the end of 2012. 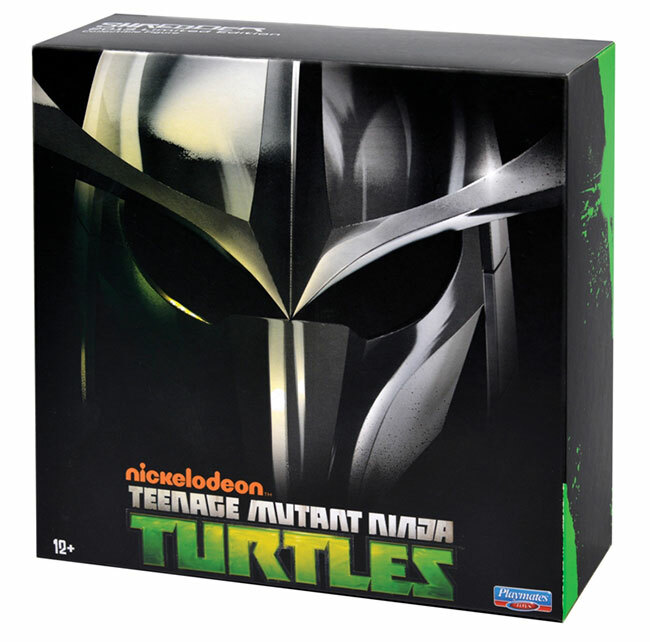 July 5, 2012 - Playmates Toys has sent along 33 press pictures of their upcoming Teenage Mutant Ninja Turtles product line. They also mentioned that "Product will be on shelf, at all major retailers (TRU, Target, Wal-Mart, and K-Mart) as well as select specialty retailers, beginning mid-August. Several mass and specialty on-line retailers will begin taking pre-orders as early as July 10th." It's totally epic! Playmates Toys has unveiled a new line of action figures, playsets, vehicles, and role play inspired by Nickelodeon's all-new CG-animated Teenage Mutant Ninja Turtles. The series has been in production at the Nickelodeon Animation Studio in Burbank, Calif., and is set to premiere in Fall 2012. EL SEGUNDO, Calif., Feb. 10, 2012 -- In a totally epic return, Teenage Mutant Ninja Turtles, one of the most popular kids' entertainment brands of the past 25 years, will emerge from the sewers just in time for Toy Fair in New York City, February 12–15, Booth #1829. NEW YORK, Feb. 9, 2012 -- Nickelodeon is headed to Toy Fair 2012 with its most comprehensive and diversified toy portfolio ever, based on popular entertainment brands for preschoolers, kids, and tweens. Nickelodeon will unveil products for both new and established properties, including Teenage Mutant Ninja Turtles, Winx Club, Team Umizoomi, Dora the Explorer, SpongeBob SquarePants, and Victorious.